Why do we make people commute so far? Photo by Ryan in the Torontoist Flickr pool. I have been thinking a lot about the megaproject phenomenon lately. I wrote about it with specific reference to the Scarborough Subway Extension recently, and I also noted that the extension is only one of several transit megaprojects in the works or hoped for in Toronto. Around the world, megaprojects have an undeserved cachet among politicians, who successfully sell them to voters, and then everyone drags poor planners along into the mess. Megaprojects routinely fail to deliver as promised. Badly. They burden their communities with heavy costs, even leaving the economy in worse shape than before the project. They have a terrible track record. So what is their appeal? Imagine we had to figure out how to move a few million people around the GTA every day—but imagine we are starting from scratch. Imagine that today, no one is moving, but in exactly five years, they will all move. I would like to think that if we could start over like that, we would make different decisions. We would recognize that wrapping each individual in a large metal box is far from the most efficient way to move millions of people. I like to think we would design a city where you didn’t have to go across town for basic needs, a city where neighbourhoods are self-sufficient. In The Death and Life of Great American Cities, Jane Jacobs theorized that for urban neighbourhoods to thrive, they needed to be both self-sufficient and well connected to the rest of the city around them. Self-sufficiency here means that the neighbourhood has a good mix of residences, workplaces, shops, and services, so that residents do not need to leave that area to meet most of their daily needs. As many of you already know, Jacobs argued throughout her work that a healthy and successful neighbourhood is grounded in a particular built and social landscape. She advocated wide sidewalks, narrow blocks, architecture that engages actively with street life (with an emphasis on “eyes on the street”—the ability to watch passersby), residential areas mixed with commercial and leisure spaces, and clear distinctions between public and private property. These features support pedestrian mobility, random and rich social encounters, the safety of residents, and strong personal attachment to place. The idea of being well connected relates to residents’ ability to access other areas of the city for recreation and resources of interest not found locally, and the ability of others to have the opportunity to shop and work in the neighbourhood as they pass through. Neighbourhoods that are badly serviced or have a poor mix of amenities are vulnerable to crime, economic dependence and deprivation, and weak social institutions. Similarly, neighbourhoods with minimal facilitation of pedestrian traffic lack the random contact and spontaneous information flow necessary to develop broad-based community activities and identities. Although self-sufficiency and integration with the rest of the city do not guarantee that a neighbourhood will thrive, they are significant and necessary factors. Jacobs argued that if neighbourhoods are able to thrive, so will the city as a whole. Jacobs’s city gives neighbourhoods some degree of self-reliance but never alienates them from the rest of the city. Transportation infrastructure, from sidewalks to railways, is a vital aspect of connectivity and preventing such alienation. It can ease connections across distance, and it can also create formidable obstacles to mobility. High-density urban design in the pre-automobile city generally facilitated pedestrian mobility and access to resources. In the post–Second World War era, however, highways and other transportation networks have prioritized suburban commuting and external trade, too often at the expense of local connections and self-sufficient neighbourhoods. Social networks or a large income can sometimes compensate for those physical impediments, but for many people, they are insurmountable. 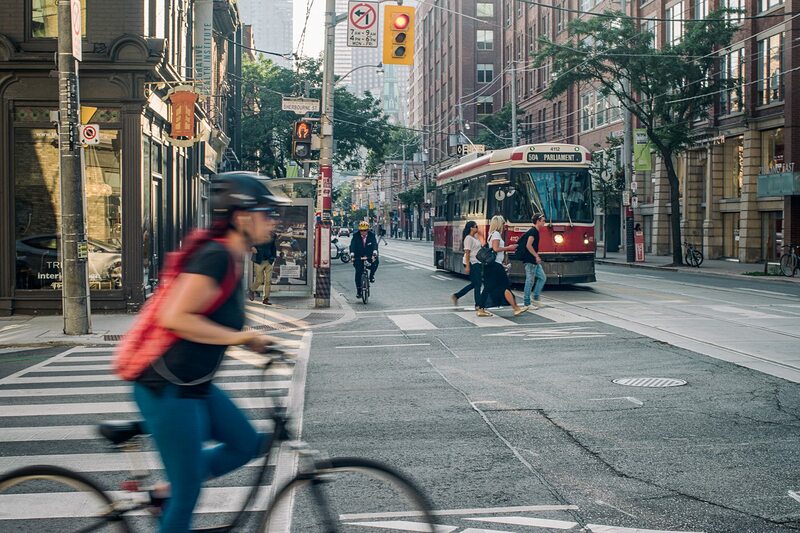 In Toronto, we have zoned ourselves into a need for commuting farther than we should have to. Huge stretches of the city are zoned for detached housing only. This creates an unsustainably low local density that cannot support shops and services. With few or no local businesses, residents have no choice but to go significant distances even for basic, daily needs. We have only half of what Jacobs thought we needed: we have the interconnectedness but not the self-sufficiency. And without self-sufficiency, we create a need for more interconnectedness than we can provide. A recent decision to allow small businesses into the ground floor of apartment towers is a small but good step in the right direction. But that “yellow belt” of detached housing is almost a third of Toronto’s land area. We have a long way to go. As city planner Brent Toderian likes to say, “the best transit plan is a great land-use plan.” The City of Toronto does not have a great land-use plan. And, frankly, neither does the province. So, instead, we’re trying to fix that weakness with a bad transit plan. We no longer think about hour-long commutes (or more) as abnormal or avoidable. We complain about time spent sitting in traffic, but as long as we’re moving, it’s all good. Everywhere I looked across southern Ontario this summer, I saw highway-widening projects. These aren’t for seasonal travellers, these are for commuters. The bigger the sprawl, the bigger the transportation megaproject. The premier seems to think it’s reasonable to plan to have people who work in Toronto live somewhere along the Toronto–Windsor corridor, a span of almost 400 kilometres. There is minimal effort by all the relevant parties to supply affordable housing for Toronto’s workers within Toronto, so people are left spending hours each day just moving from home to work and back. We’re perpetuating a time-wasting, environment-killing, neighbourhood-starving land-use plan. People should not have to travel as far or as often as they do. We can’t fix that with a transit plan, no matter how mega the project is. But apparently, we’re going to bankrupt ourselves trying.